iWFHosting.net is a brand, which belongs to the H4Y Technologies company. Based in Florida, the hosting provider offers a wide range of hosting solutions. They have been operating in the industry since 2001 and are proud of their support team, which is not outsourced. iWF Hosting can boast the advantage of offering an extended money-back guarantee of 60 days, as against the common 30-day guarantee. Finding reviews of the company is a challenge, as there are very few of them and they are three or four years old. They are all positive nevertheless, which means iWFHosting is worth recommending. Well, it would have been but for their performance. The provider offers 5 shared hosting plans. One can purchase them for 1, 6, and 12 months. The monthly prices for the cheapest offers are presented in the table above. The long-term subscriptions are the most beneficial in terms of price. The company offers a phone number and a ticket system as support options. 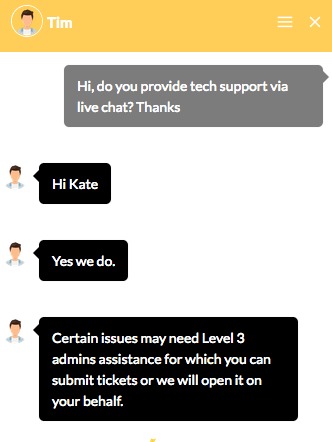 However, there is also a live chat that responds fast and offers tech support as well. 4.4 HRank and #130 were the results for IWFHosting.net in 2018. Its uptime results of the provider were not that bad, however, there were several cases of ~96% and ~98% downtime in the monitoring period. Response time was fast (~350ms) until November but at the end of the year it got slower (~500ms). Interestingly enough, this is one of the rare providers that managed to stay with pretty much the same number of websites in 2018.